I always feel bad when I get home later than normal from work. J understands why I’m late but it still cuts in to the very little time we have together and it shortens the already short time I see my kids each day. I was in Lansing for a conference earlier this week and I thought maybe I’d still make it home by the time I normally get home. One of the speakers went long and it pushed back my departure time. I knew I was going to be late so I decided to bring home a treat that would make everyone forget that I was a half hour later than normal. I couldn’t find a parking space near the Lansing Center so I ended up over near the Capitol. This worked to my advantage because I had to walk down Washington Square to get back to the ramp. On my morning walk, I noticed a popcorn shop and my family loves popcorn. 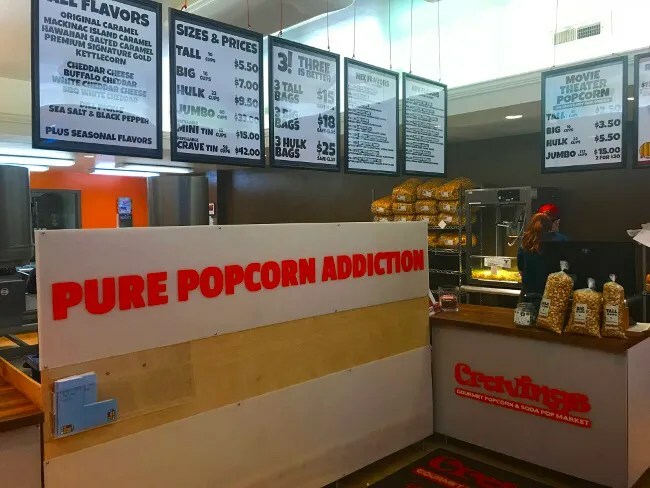 Cravings Gourmet Popcorn is on Washington Square in downtown Lansing. The small shop is sandwiched into a much larger building that has retail at street level and lofts above it. Before it was a popcorn shop, it was Ernesto’s Hideaway General Store which closed in 2013. 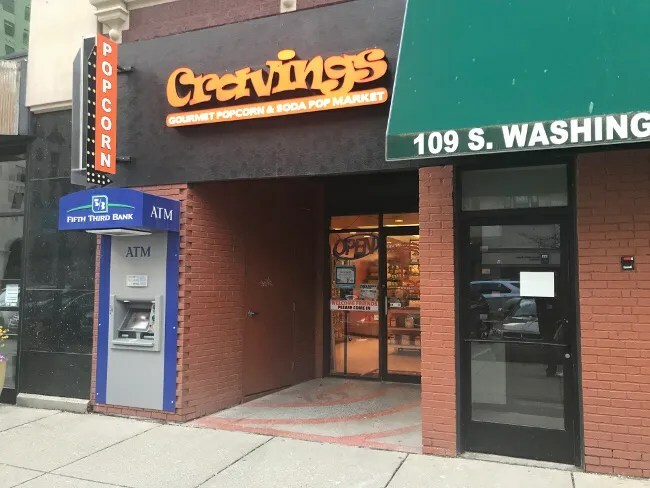 Cravings opened in 2015 and it’s now one of two locations in Lansing. 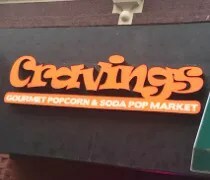 Cravings got it’s start in 2007 at the Lansing City Market. They then followed up with a store in Old Town and Okemos. This shop was #3 but is now left with just the original Old Town shop. The retails space is pretty small and tightly packed. There is a small order counter off to one side of a half wall that separates the production area from the public space. Above that wall is a large menus board showing the different flavors as well as the pricing. Can’t decide what to order. There are gumball like dispensers in the middle of the room so you can try all of their flavors. I knew what I was going to get for J. She has a pretty intense love affair with what’s known outside of Chicago as Chicago-Style Popcorn. 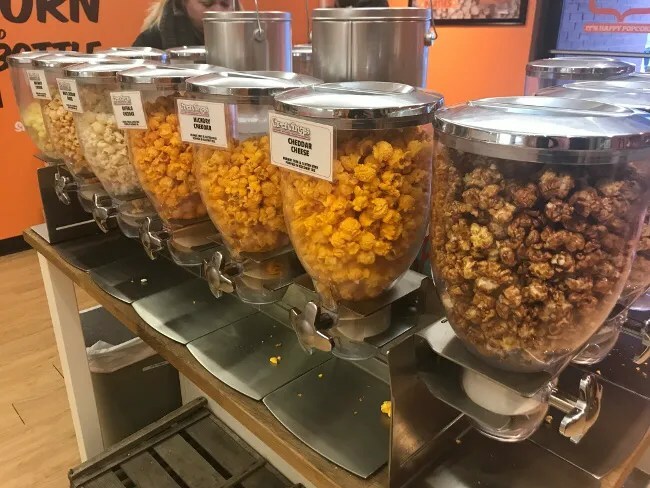 Within the city, it’s Garrett Mix…at least to J, that’s what it is because the best place to get it is at Garrett Popcorn Shops. Cravings has their own version they simple call Cheddar Caramel Mix. Their website says “This is the just like the famous popcorn you’d find in Chicago, but better (according to our customers). ” so, yeah, this is what I was looking for….although I think J would disagree with it being better….but to us, Garrett is it…Garrett is the original and it’s home,so there is a lot of loyalty there. She still enjoyed it and I really liked the cheddar popcorn that I picked out (I don’t like caramel corn that much). The tall bag holds 10 cups of popcorn and there was a really good mix of cheddar and caramel. It’s mixed by the employee just before it’s put in to a bag so the heavier caramel doesn’t have time to settle to the bottom while sitting on a shelf somewhere. I was going to order a big thing of movie theater popcorn for myself and the kids, but the lady in front of me bought up the last of what was made. It was late in the day so I didn’t want to ask the employee to make a new batch just for me. Instead, I ordered a Big Bag of White Cheddar Cheese. This one was good. It just a rich cheese flavor without leaving a huge mess on your hands. J ended up really liking this one too and eating some of it. I think it was even a little better than the regular cheddar cheese popcorn. I mean, it was really good. The “Big Bag” which is about 16 cups didn’t last long at all. Cravings Gourmet Popcorn is good popcorn. They have a number of flavors that I didn’t even dive into here. I tried the Hot Kansas City White Cheddar and it tasted like I was biting into a salty, delicious pepper….but I really needed a glass of milk afterwards. 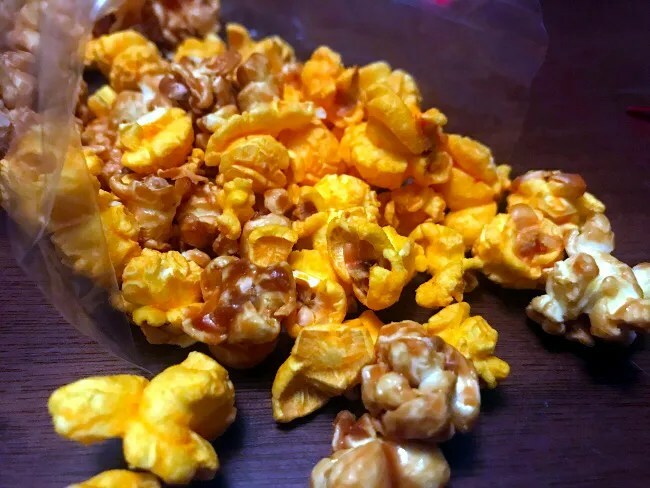 Cravings is so much more than the typical butter, cheese, and caramel popcorn place. There are so many flavors to choose from and so many ways to come up with unique combinations. 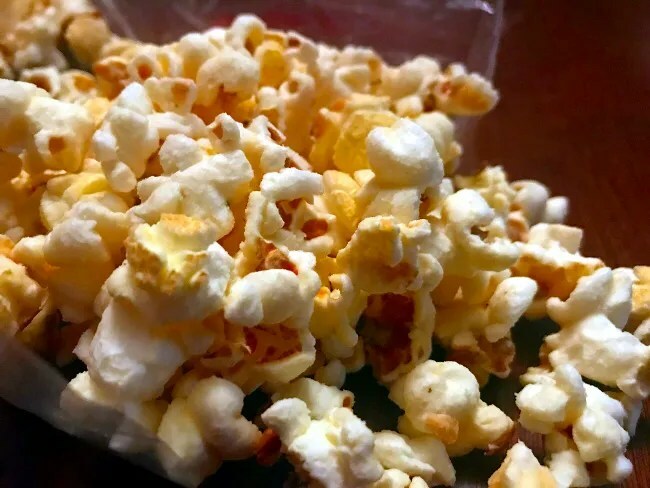 I was just expecting something to make my kids happy when I stopped in but I found popcorn that I really liked and, sorry for the bad play on words, am actually craving as I wrote this entry. Great blog post. I really love Cravings Popcorn too.